This will represent the U.S. Army in the FFVA'19 if I can finish it in time. This will be my last new project for the year, I still have to finish the Raptor and the YF-21. I am pretty happy with the overall shape and it looks like I can get everything to fit nicely. The scale RC-12 has about 101 versions and every one of them has 1002 antennae sticking out in every direction. There is no way that would work on the little RC version so I took a few visually important ones just to give the effect. I enlarged the empennage a bit, but the wings only a taste. A large portion of the outboard wing is a single width underchamber so it should create enough lift. Still, I may have to lengthen the chord a bit more as well. It is hard to picture that kind of thing without seeing it finished sometimes. The AUW will play a big factor in that also. I have not even started the foam-fu yet, so it might be a while before I actually start building. That said, I like it a lot already and I am eager to get started. This will be a nice change of pace for me. Looks like it's going to be another awesome plane, probably pretty quick too! I cant wait to see how this one flies. Looks cool. Should move along nicely on those twins. I hear ya on the speed. Honestly, that is not really the goal with this build but I have like 50 of those motors laying about. I hope to build it around a mighty mini twin pack officially. But yeah, the prototype will be a screamer with that power setup. I like this. I worked on King Airs for years, great planes. Though the RC-12 is based on the 200 which is my least favorite to work on. I am still interested to see the end result. My hope is to make all of the Guardrail parts optional so someone could make the C-12 Huron if they so desired. At first glance I did not see to many differences in the C-12 and the King Air 350i, but honestly my knowledge of this particular airframe is quite low. I think this would be a good design to scale up to like 1/12 scale or so. I would have to do some math, but something like a twin C-pack sized. C-12s that are brand new are possibly 350s and have been almost every variety of t tail king air to my knowledge including the 1900 airliner. But most of the RC-12s have been derived from 200s in the past. Including the X models which are 200 airframes with higher Shaft hoarse power engines and modified tail sections from the 1900C to deal with the props/torque and the strange aerodynamic loads from the antenna configurations. Just a side note standard 200 wing panels between engine and fuselage were not lifting surfaces at normal AOAs. That little birds hated to leave the ground until a fair amount of up elevator was added to take off. Raisbek created an STC to change the wing leading edges changing to airfoil and making it a much better aircraft. 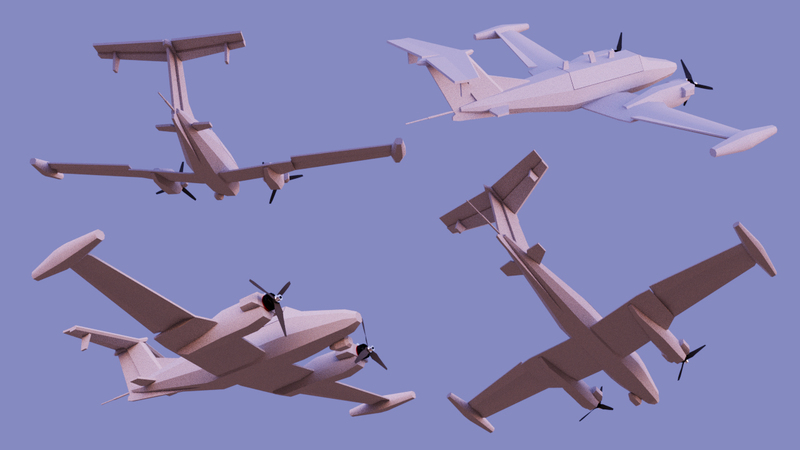 The Shape was fixed on future Ling Air variants. Thanks for the insight on the different models. I noticed on the C-12 three view I have, the wing section between the nacelles and the fuselage had a shorter chord than the root of the outboard wing. That kind of struck me as odd. I wonder if the new wing design is still like that or if that was part of the change. I modeled mine equal on both sides (or straight if you will) just for ease of build, but I will see if I can come up with a set of 300 series three views to compare. I have to admit, I was not sure about this choice of airframe for the Army bird at first. Now the more I look at it, the more it grows on me. This will be a fun build. Looks awesome! 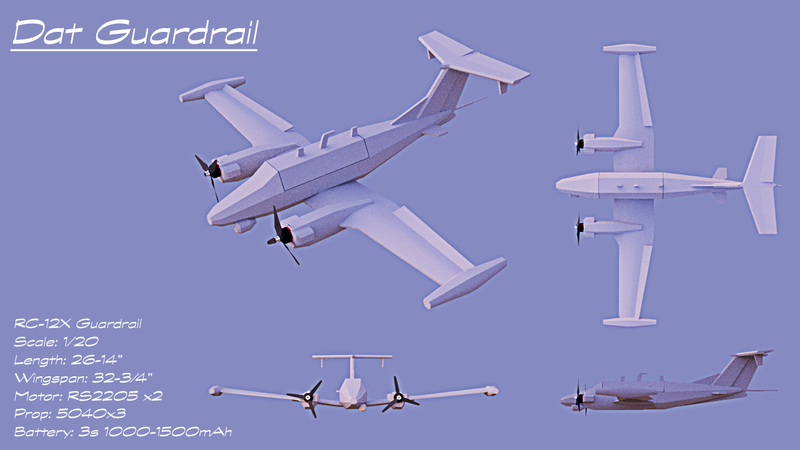 If I build one it'll probably get painted like a Kingair 350 instead of an RC-12, but I love the design. Yes the center wing is narrow compared to the outer wing. I can get some 3 views for you if you want but it will not be till I am back to work next week ( vacation for wedding anniversary this week). I have access to maintenance manuals for the king airs as well as the Cessna fleet. Those all have 3 views that I can normal export. It is a great choice for army, only the old queen air is close for me for army aircraft. I am using the same motor mount design I use for my prop and slots which are wider than the nacelle, but those will be covered with the exhaust parts. The fuse is completely done except for the formers/bulkheads. The empennage is done as well. The wings are mostly done and are next on my list after I finish the nacelles. It might have a few more parts and cuts than a standard FT design, but so far I do not see anything that would make the build difficult. I will know more later though.